Mid Penn Bank today opened its second Lancaster County branch, located at 1817 Oregon Pike in Manheim Township. The bank held a ribbon-cutting ceremony this morning to celebrate the opening. The Oregon Pike branch extends the bank’s footprint to include 21 branches in Central Pennsylvania. The location has three employees to fulfill personal banking needs, business banking needs and lending needs. The branch’s hours of operations are 9 a.m. to 4 p.m. Monday through Friday. Mid Penn also offers online banking, mobile banking and telephone banking to provide customers with 24/7 account access. 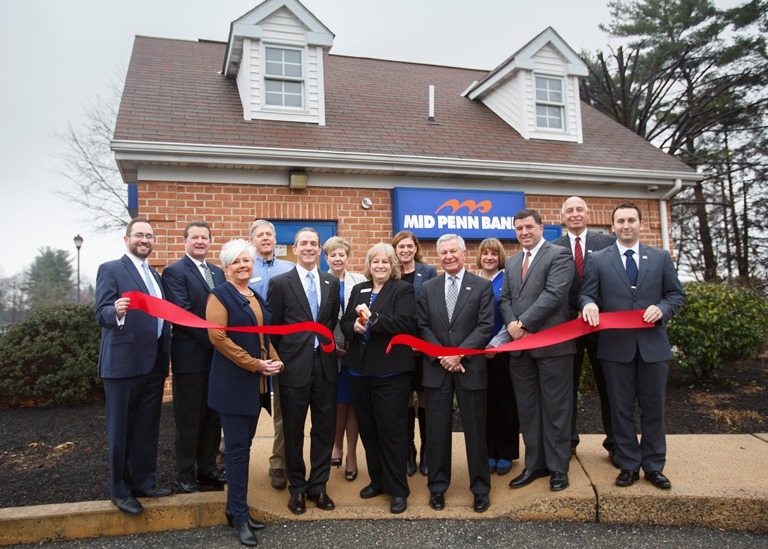 Mid Penn opened an administrative center at 1821 Oregon Pike in July of this year for its growing group of Lancaster-based lenders and support staff. Additionally, the bank announced in November that it is seeking regulatory approval to open a branch at 685 West Main Street in New Holland. Mid Penn Bank, subsidiary of Mid Penn Bancorp, Inc., has 21 retail locations in Cumberland, Dauphin, Lancaster, Luzerne, Northumberland and Schuylkill Counties. Headquartered in Millersburg, Pa., Mid Penn offers a comprehensive portfolio of products and services to meet the personal and business banking needs of the community. To learn more, visit midpennbank.com.